White paper on crime 2004 Part4/Chapter2/Section4/2. Fig. 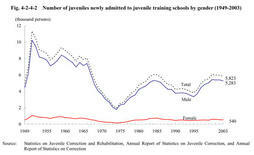 4-2-4-2 shows the number of juveniles newly admitted to juvenile training schools since1949.In2003,5,823juveniles were newly admitted,down2.3%from the previous year.The average daily number of inmates accommodated in the training schools was4,726,down1.4%(see Appendix4-11).Although both numbers decreased slightly from the previous year in2003,percentage change of the newly admitted juveniles since1995was an increase of52%,58%for males and14%for females. Table 4-2-4-3 shows the number of juveniles newly admitted in2003by type of juvenile training school and treatment program.By type of school,83.0%of inmates were admitted to middle juvenile training schools.The second largest was admitted to primary juvenile training schools,followed by medical and special juvenile training schools. During a10-year period from1994,the number of juveniles admitted for special short-term program has declined(Source:Annual Report of Statistics on Correction). In2003,5,789inmates were discharged from juvenile training schools,5,587(96.5%)of which were released on parole.Of those discharged,30.5%had found jobs,50.1%were seeking employment,11.2%wished to enter the next stage of schools,1.9%returned to junior high schools,2.4%returned to senior high schools,and2.8%had no prospects for subsequent education or employment.The percentage of those who had fixed jobs or schools after discharge was34.8%,a decrease of1.4points from the previous year(Source:Annual Report of Statistics on Correction). The average detention period of those released on parole was380days for long-term program,150days for general short-term program,and87days for special short-term program(Source:Annual Report of Statistics on Correction).